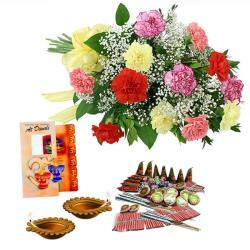 Product Consist : 2 Diwali Diyas, Diwali Card, Basket Arrangement of 15 Mix Colourful Roses along with Diwali Fire Crackers (Worth Rs. 300/-) (Note: Firecracker will be deliver as per their availability no specific choice for it). Make your loved ones Diwali special with this combination and make them realize what they mean to you. 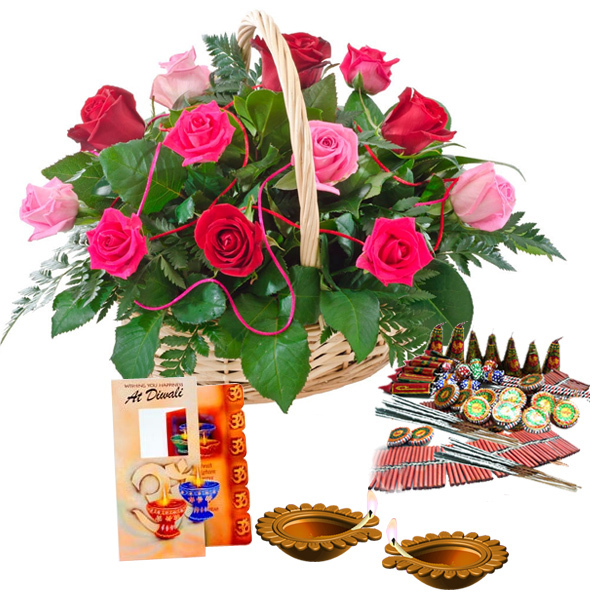 Presenting the most thoughtful hamper specially for the festival of Diwali that has a gorgeous blend of pink and red Roses along with Diwali greeting . Light up your dear one home with diwali diyas and assorted Fire crackers are one of the most significant parts of Diwali celebration and more desirable is to get them delivered to your doorsteps. 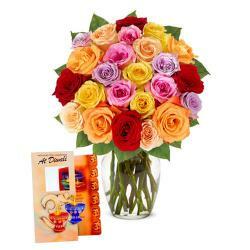 Order this for yourself or send this as a gift to your dear ones making them realize how special they are to you. 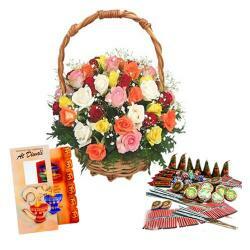 They will definitely love this combination of Roses with crackers for Diwali. 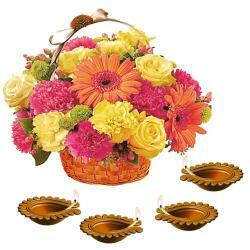 Product Includes : 2 Diwali Diyas Diwali Card Basket Arrangement of 15 Mix Colourful Roses along with Diwali Fire Crackers (Worth Rs. 300/-) (Note: Firecracker will be deliver as per their availability no specific choice for it).